Have you ever visited a blog? If yes, then you may have seen some pages that are common on every single blog. Have you ever thought about what are these pages and why blogs and websites have such pages? 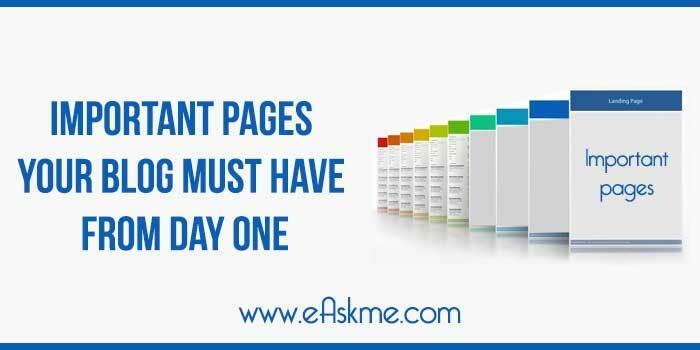 These pages are known as “Important pages” of a blog or website. Why Important? The answer is, it shares the exclusive and important information about blogs. Today I am going to share about what are the important pages, the need, and usage of most important pages for your blog. If you are going to start a WordPress blog then it is really easy to create important pages on your blog. Just follow these steps. Now you know it is easy to create important pages. How do you think you can contact the admin of a website? The easiest way is contact page. You can also include the address of your social networks so that users can contact you there also. The most important part of a contact page is a contact form. You can easily install contact form 7 plugin to install a contact page on your blog. What is the most visited page of any blog? Do you think that it is a popular article or high ranking article in Google search? About us, the page is one of the most important and most visited pages of any website or blog. It is simple. Every person wants to know what your site is all about and what are you offering. Even on my blog, it is the most visited page of my blog. Your about page should tell the real information about your blog. It helps to build trust among your readers. It is a good idea to share your success story and some of your products. Are you just writing blog posts or also offering services such as consultancy or some other services. Services page is the place where you can showcase your services. It will be great if you can showcase testimonials and references to build trust. You can also use about page to write about your services. Service page is also necessary to tell clients what services you are offering. If you are running a blog to make money online by selling products then it is really necessary that your blog should have a disclaimer page. It will be better if you can make it clear that you are linking to external sources. You can also declare that you are not responsible for any damage caused by third party products. It is not easy to write disclaimer page. You can also use disclaimer generator. Privacy Page is also one of the most important pages. Every blog should have this page. In this page, you should declare the use of third party ad networks and cookies policy. Are you one of those bloggers who is promoting affiliate programs? If yes, that means your blog must have an affiliate disclosure page from day one. In this page, you should display the information that you are using affiliate links on your blog to earn a commission. Remember: Many affiliate networks only accept your application if you have affiliate disclosure page. Sitemap page is an important page. It is important from SEO perspective. Sitemap page contains links to all the pages and posts on your blog. It helps web crawlers to easily index your blog posts. Do you know what a 404 error page is? When a visitor visits a dead link on your blog then he will be taken to 404 error page. I recommend you to design a beautiful 404 error page that not only tell them about the dead link but also guide them to some helpful resources. Now you know what the most important pages are. Remember it is the professional way to work in the blogging business. Always have what it takes to be a professional blogger.